Submitted to NEEDLES by Fr. Robert Levis, M.A. by Rev. Robert Lewis, M.A. THE FOLLOWING EXCERPTS are taken from a report submitted to NEEDLES by Fr. Robert Levis, M.A. of Kallianpur, India. Fr. Levis is an exorcist priest who works at the shrine of St. Jude in Pakshikere, India. Every Monday and Tuesday, for periods of four to five hours each day of the past six years, Father has been praying over the sick and possessed. Concerning the statements issuing from mouths of these poor possessed souls Fr. Lewis says, "What is related here though it may appear very strange to some, is nevertheless true. The devil who is called the 'father of lies' in Scripture, does tell the truth when ordered to do so in the name of Jesus." 1 The language of possessed cases is quite profane and has had to be toned down by Fr. Lewis so as to make it printable. The name of Mary is so powerful that Lucifer himself begs the exorcist never to mention it, confessing with shrieks and shouts that it was she who crushed his head. After the names of Jesus, Mary and Joseph, there is none more terrible to demons than that of St. Michael. "We hate him", shouts Lucifer, "Why did he dislodged me from my place in heaven and thrust me down to hell? He is everywhere to defeat my hosts. He enters even ours most hidden places suddenly and unknowingly to disclose our deepest secrets and destroy our plans." The possessed person actually shows in his face the excruciating torments he suffers when, for instance, the rosary or the scapular is placed around his neck, or holy water is sprinkled over him. He invariably shouts and groans, "It is fire! it is fire! Remove it, I beg of you! I cannot bear it any longer," thus helping us realize the great power of the sacramentals which we, unhappily, belittle today, without realizing that our loving mother, the Church instituted them for us to ward off the devil. Very often the devil shouts, "If you priests were united, if you prayed and fasted, would there be any chance for us to stay in this world, let alone in these bodies? But we cannot get out because the One above does not allow us until you do what your Master commanded you. Was the power given by Christ to be ignored? Look at our agents and devotees, spending whole days shouting and singing, invoking us false gods. And you, the worshippers of the true God you are asleep! Equal my worshippers at least in their enthusiasm and we will go." Joey Lamangino gave me a medal touched by St. Michael when the archangel appeared to the children at Garabandal. This medal was also touched to the miraculous medal which was kissed by Our Lady during the same visions. Joey told me that it would help me much in my work. After our meeting I returned to the Shrine as usual for the Tuesday novenas and began the prayers over the sick and possessed. Two of the possessed began immediately to shout, "You are going here and there to speak about us; you meet important people and tell all about us and disgrace us. What was the need for you to go to Bangalore? We don't like the name of Joey, I say that you are a follower of a blind man! Yes, I say that! Let people laugh at you! That way at least you will give up this work and stop coming to the Shrine. You have brought a Spanish sacramental to destroy our strength. I beg of you not to touch us with it." Saying this, the possessed persons began to bang their heads on the ground and shout, "Leave us! Leave us in peace! We are going. We are going." After making the possessed persons kiss the medal, which they refused to do for a long time, the devils screamed loudly and left them. Fr. 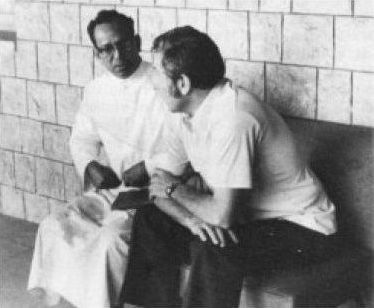 Lewis explains about possessed cases to Joey Lamangino, who has twice toured India making known the Garabandal Message. "Repent, while you have time given by the Father (pointing upwards). We are here in these bodies because of the terrible sins people commit everywhere and because they are hardened in their sins. If you admit your guilt, we cannot utter a single word against you nor do anything to you. The one above does not allow us. If you do not repent, we will be there to accuse you before the Father of every fault. Don't you know that this is the time of the Holy Spirit? Nothing will remain hidden during this time. Will not God Himself come suddenly to judge? Will there be time to repent then? Will not the Great Miracle happen as announced by Our Lady? But who believes it? They don't want to. This place, Pakshikere, has been chosen by God. Hasn't He given enough proof to show that it is a chosen place? And to let people know through us all the terrible sins man can commit? How hardened in sin he can be. How man, joining our kingdom, rejects God's grace for the sake of wealth, power, and glory. The one above waits because He is merciful. But will He spare anyone if he does not repent? No! Not even bishops, priests, nuns, the laity, or the non-Christians can escape His hands." They shriek with pain and bang their heads and say, "Are these things to be brought out from our mouths? Our work is to preach and do just the opposite of what Christ and His Church preaches. For we have broken with God forever! Though we know well that we cannot possible defeat God, we are impelled to fight against Him. It is the One above is forcing us to say what we are saying because of the prayers at the Shrine. If you priests, i repeat, were united and preyed as our worshipers do, would there be any chance for us to stay in these bodies? But who is there to do it? A few, and ours are in the millions. What are you Christians doing? Where are your Holy Hours? Who has the time for them when you have other more pleasant things to do. Isn't Jesus in the Blessed Sacrament, and He alone the One Who can get rid of all your worries and sicknesses. We laugh! Because you are few against us. Instead, are you not coming to us, and to our superstitious acts to get rid of your troubles? Yes, you Catholics! Will God spare you unless you repent?